Help your friends, shred your enemies. Indie developer ManyHat has released Transphoria, a first person shooter/survival game that supports two player co-op. 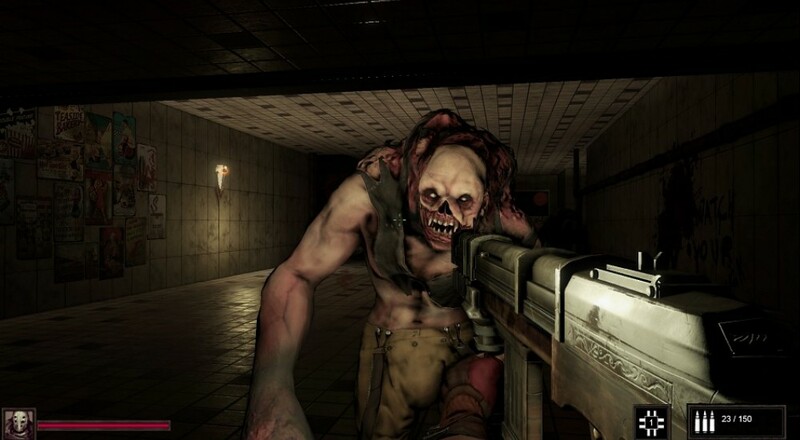 Moody lighting, scary creatures, lots of guns, and it's free! Transphoria keeps things simple. All you need for a good time are a few weapons, a few levels, a few enemies, and some dark corners for things to sprint out of to bash your head in. It's an experience not too unlike Left for Dead, though with a stronger emphasis on the wanton shooting and killing part of things. Co-op mode drops you and a friend in the single player stages so you can give each other a hand in not dying. You can also heal your buddy, which is a pretty nice thing to do when you're both about to get eaten by Sloth from The Goonies. Pick from three levels to play through, each with its own overall mission and story: Blast Proof, Derailed, and Breakout. No matter what kind of creepy things are going on, you can always assume the goal is to run ahead, shoot stuff, and stay alive until you reach the exit. There are some fantastic lighting effects throughout each of the stages, setting a truly eerie mood. The enemy models also look great, and you'll get some heartwarming close-up views of them as they rush towards you in groups of half a dozen at a time. Transphoria is currently available for PC via Desura. It supports co-op play for up to two players via LAN. Page created in 1.0359 seconds.